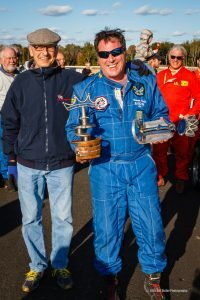 In support of the Vintage Racer Group (VRG) and their efforts to promote Formula Fords, Royale created the Formula Ford Cup; which is to be given away annually at a VRG event. 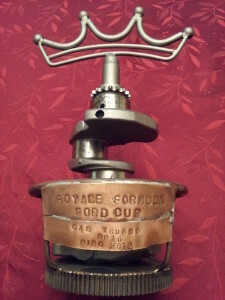 The cup was a creation by Graham Long, using Formula Ford parts with a recreation of the Royale crown at the top. Each year the winner will be added to the cup with a stamped brass plate that is soldered to the base with information representative of the event and winner. 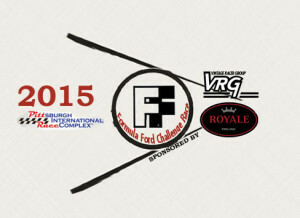 In November, Royale Racing was asked by VRG to assist in doing something for the 45th Anniversary of Formula Fords. To this end Royale created the VRG/Royale Formula Ford Challenge Series and donated time, effort, and of course monies to the 3 event series. The Royale Cup was awarded to the overall winner. On the heels of a successful 45th Anniversary Formula Ford Race Series, Royale Racing would like to announce that in 2015 we will be supporting the PVGP Historic Races once again. This event will be help on the newly expanded Pittsburgh International Race Complex (PIRC) track (2.8 miles, 19 corners). We expect the expansion to add a whole new dimension to an already fast, yet technical venue. Please join Royale Racing as we support the Pittsburgh Vintage Grand Prix organization; which has raised over $3.7 million for the Autism Society of Pittsburgh and Allegheny Valley Schools during the past 30+ years. 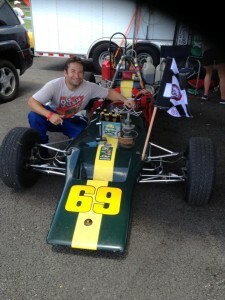 Royale Racing has been asked to assist with an annual series for Formula Ford. On the heels of a successful 2014, and by demand in 2015 … Royale is back as a key coordinator and supporter of this VRG initiative for Formula Fords. If you follow the Royale Formula Ford Challenge Series, then you have certainly realized the following: under the new model, each classification of Formula Ford has a unique trophy designed to support the genre and the Royale Formula Ford Cup to represent the overall winner…what an honor! Over 70 drivers participate in our 1st year, averaging 25+ cars per event … WOW! 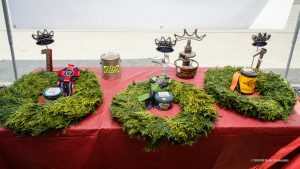 Thanks go out to all the drivers, crew, and heck all that helped to make our inaugural year such a success. In total over 100 participants for year #2 and fields with car counts of 47 @ J500 and 41 @ Watkins Glen, the likes of which have not been seen since the height of Formula Ford racing in the 70s and early 80s! Again we THANK all the drivers, crew, and everyone associated who help to make the series such a success. Late in 2018, Royale parted ways with the Formula Ford Challenge Series. Royale believes in ‘inclusion’ not ‘exclusion’ and therefore pulled the cup as part of the 2018 series awards. We here at Royale wish them the best of luck! As Royale enters 2019, we are working steadfastly to find a new home for the cup. MORE TO COME …..